More than the necessary dose of sweetness! ← “Too much chocolate” is nonsense: triple chocolate cupcakes. Strawberry meringue buttercream over Math any day! I’m in the midst of an early-Saturday-morning Math fest and it isn’t fun. So mechanical and abstract – and so not delicious, unlike these cupcakes 😦 I haven’t tried out this recipe but it’s high on my “Things I Ought to Bake” list and primarily because the strawberry meringue buttercream (SMBC) just looks so tempting!!! Seriously, how can you not look at the photo above and just drool? This is finally a switch up on all the chocolatey recipes (and also a new source, browneyedbaker – a good baking blog you should bookmark!) hehe, and I’m looking forward to finally baking something non-chocolatey. I mean, I love my chocolate very dearly but it is rather heaty and not too healthy too… Not that buttercream is any healthier (probably) but strawberry would be a freshing treat for the palate! 1. Make the Cupcakes: Preheat oven to 350 degrees F. Line standard muffin tins with paper liners. 2. Whisk together both flours, baking powder and salt; set aside. 3. With an electric mixer on medium-high speed, cream together the butter, sugar and vanilla until pale and fluffy, about 3 minutes. Add the eggs and egg white, on at a time, beating until each is fully incorporated, scraping down the sides of the bowl as needed. Reduce the mixer speed to low and add the flour in two batches, alternating with the milk, and beating until well combined. Use a rubber spatula to gently fold in the chopped strawberries by hand. 4. Divide the batter evenly among the lined cups, filling each three-quarters full. Bake until golden and a cake tester inserted in centers comes out clean, 25 to 30 minutes. Transfer to pans to wire racks to cool for 15 minutes; turn out the cupcakes onto the rack and let cool completely. Cupcakes can be stored up to 1 day at room temperature in airtight containers before frosting. 5. Make the Strawberry Meringue Buttercream: Puree the strawberries in a food process or blender; set aside. 6. Combine the egg whites and sugar in the heatproof bowl of a standing electric mixer set over a pan of simmering water. Whisk constantly by hand until the mixture is warm to the touch and the sugar has dissolved (the mixture should feel completely smooth when rubbed between your fingertips). 7. Attach the bowl to the mixer fitted with the whisk attachment. Starting on low and gradually increasing to medium-high speed, mix until stiff (but not dry) peaks form. Continue mixing until the mixture is fluffy and glossy, and completely cool (test by touching the bottom of the bowl), about 10 minutes. 8. Reduce the mixer speed to medium-low and add the butter a few tablespoons at a time, mixing well after each addition. Once all the butter has been added, scrap down the sides of the bowl with a spatula and switch to the paddle attachment; continue beating on low speed until all air bubbles are eliminated, about 2 minutes. Add the strawberry puree and beat until combined. Stir the frosting with a rubber spatula until the frosting is smooth. Keep the buttercream at room temperature if using the same day, or transfer to an airtight container and refrigerate up to 3 days or freeze up to 1 month. Before using, bring to room temperature and beat with paddle attachment on low speed until smooth again, about 5 minutes. 9. Decorate the Cupcakes: Spread or pipe the buttercream onto each cupcake. Store cupcakes in an airtight container at room temperature for up to 1 day, or refrigerate for up to 3 days. 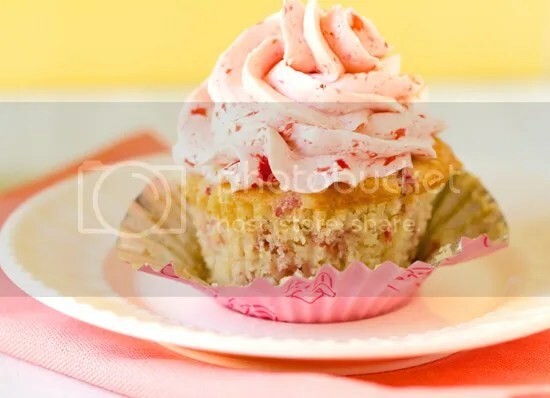 This entry was posted in Cupcakes, Strawberry, Untested and tagged buttercream, SMBC. Bookmark the permalink. Math will drive me crazy… Oh, peanut butter and Nutella cookies? A weekend like this calls for a sugar rush: cake pops!